I was craving for a good Strawberry Salsa for sometime now. It all started when Sid had a mini meltdown in Kroger over a box of Strawberries a couple of months ago. The kid loves berries and Strawberries are his favorite. But out of season Strawberries aren't exactly sweet and juicy. But he was adamant. As expected they were TART and almost inedible. Sid ate them anyways, puckering at the tartness after very bite. That's how much he loves Strawberries! It stuck me a few days later that instead of torturing the boy, I should have made Strawberry Salsa. That's what you do with sad fruits. You turn them into Salsa! So I went ahead and got my self another tub of out-of-season Strawberries, with the sole idea of making the Salsa. The next tub of Strawberries, that we got weren't as tart. They were red, plump and extremely fragrant. But definitely not as sweet and juicy as the sun kissed summer berries. I cannot wait for the summer and the berry grandeur to arrive! 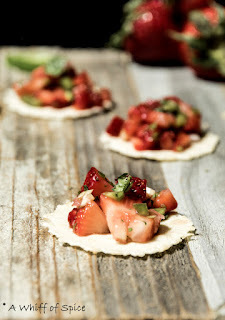 This recipe is little different than my other Fruit Salsa recipes. Instead of my usual "lime juice-grated ginger-rock salt" combination, I went with a Balsamic Vinegar dressing. Strawberries and Balsamic Vinegar compliments each other very well. 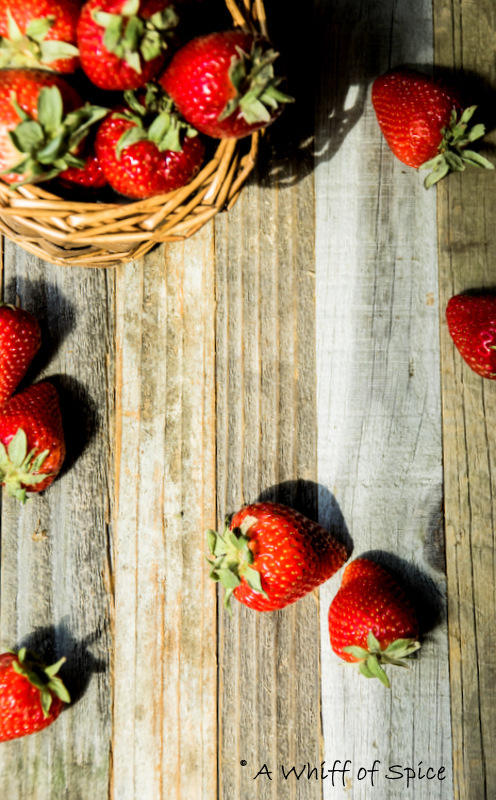 The sweet and fruity flavor of the Balsamic Vinegar enhances the color and the sweetness of the Strawberries. Also, I opted for the mild Scallions (Green Onion), in favor of the Red Onions. 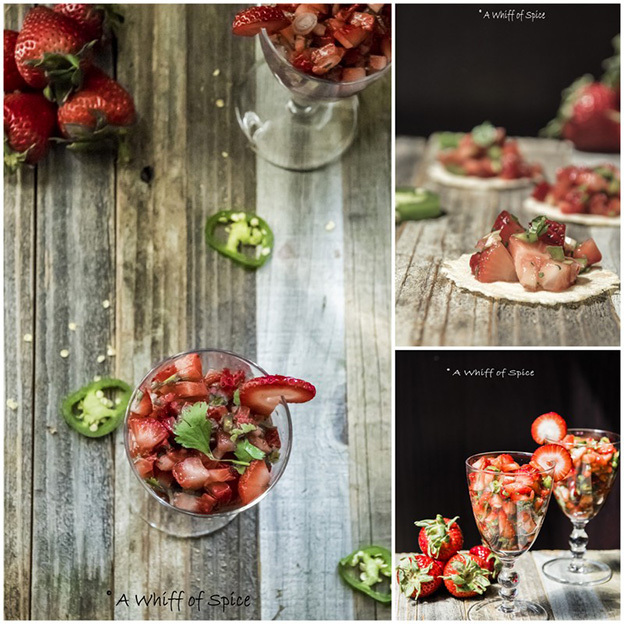 All my Fruit Salsas have a great balance of sweet and savory flavors. I wanted the savoriness of the onions but did not want to overpower the sweet, delicate flavor of the Strawberries. The Jalapenos gives it the much required heat and the Cilantro provides great flavor and freshness. However, compared to my other Salsa recipes, the quantities of both Jalapenos and Cilantro are greatly reduced. I wanted the flavor of the Strawberries to shine through. This Strawberry Salsa is sweet, fruity and so very flavorful. Not only its a great Chip n Dip Recipe but it goes exceptionally well with Grilled Chicken Breast and roasted veggies. It brings a wonderful sweet and fruity flavor to your wrap and tacos too. My fruit happy family loves any kind of fruit based Salsas. The Strawberry version is no exception. Hope you'll give in a try and fall in love with it too. 1. 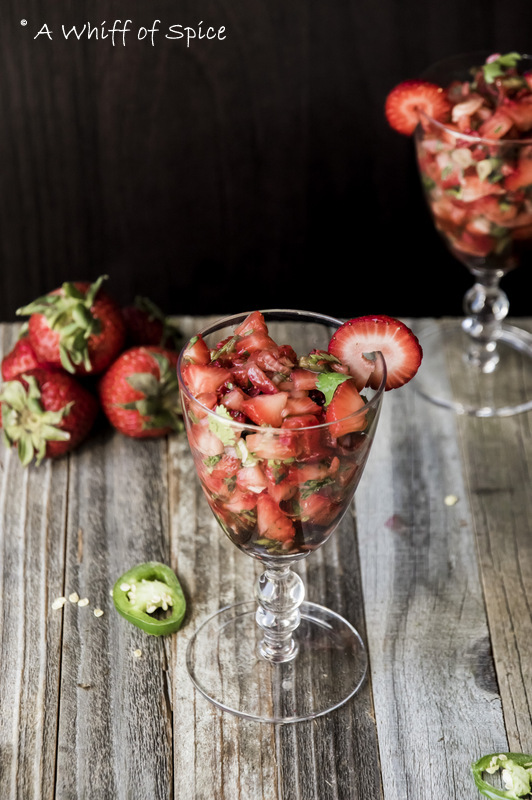 In a big bowl, combine the chopped strawberries, green onions, jalapenos and cilantro and give it a good mix. 2. Add the balsamic vinegar and Himalayan pink salt (or any sea salt of choice) and mix well. Taste and add more accordingly. 3. Cover and chill for an hour for the flavors to amalgamate. Serve with chips, crackers or big spoons! Notes/Tip: This soup does not have many ingredients. The garlic is the most pronounced flavor in this soup along with the subtle tang from the tomatoes. If you have really tart tomatoes, decrease the quantity of tomatoes and increase the amount of lentil or add a a little sugar to balance out. (3) prevention of certain cancer types including breast, cervical, colon, and esophageal cancer. Guacamole - The Eternal Favorite Dip!